The White House has announced a new US strategy for sub-Saharan Africa, which focuses on the continent's economic potential. It also explores issues related to democracy, security and development. President Barack Obama said African democracy had improved but corruption was endemic in many countries and state institutions were weak. The strategy comes as China's presence on the continent continues to grow through investment and trade. Mr Obama said he would work with Congress to develop preferential trade agreements with African countries, while fighting al-Qaeda and its affiliates on the continent. "As we look toward the future, it is clear that Africa is more important than ever to the security and prosperity of the international community, and to the United States in particular," said Mr Obama, the US-born son of a Kenyan man. The White House said its new Strategy Toward Sub-Saharan Africa provides "a proactive and forward looking vision grounded in partnership". A bid to increase trade and investment in sub-Saharan Africa is among its aims. The US administration is reaching out to entrepreneurs through exchange programmes. It will try to match US and Africa companies for business opportunities. The strategy is the result of four months of work, during which advisers looked at how to address the challenges the continent faces from famine to instability as well as the continent's economic potential. The BBC's Kim Ghattas in Washington says the strategy is partly aimed at encouraging the US and Africans to do business together. Our correspondent says this approach could also provide an opportunity to help revive the flagging economy in the US. The announcement indicates a renewed focus on Africa, but as the plan is short on detail for now it is unclear how the strategy differs from what the administration has been doing so far, she says. Some African countries already enjoy trade preferences with the US - through the Africa Growth and Opportunity Act (Agoa) - on the condition they uphold free elections and markets. At an Agoa forum in Washington on Thursday, US Secretary of State Hillary Clinton said that Africa was the "land of opportunity". "I want all of my fellow American citizens, particularly our business community, to hear this: Africa offers the highest rate of return on foreign direct investment of any developing region in the world," AFP news agency quotes her as saying. 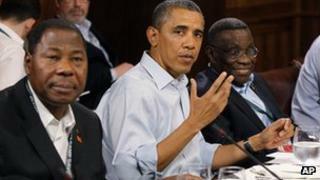 Last month, Mr Obama announced a $3bn (£1.9bn) plan to boost food security and farm productivity in Africa. US officials said that initiative was aimed at alleviating shortages as world food supplies are being stretched by rising demand in Asia's emerging markets.